Photographer Matthew Carbone has sent us his photos of Frank Gehry's latest project, the recently-completed Lou Ruvo Center for Brain Health in Las Vegas. The research centre for degenerative brain diseases is divided into two separate buildings connected by a courtyard. The first forms a jumble of swooping stainless-steel arcs and houses events spaces to rent. The second contains clinics and research facilities dedicated to preserving memory, and consists of white stacked boxes. All photographs are copyright Matthew Carbone. 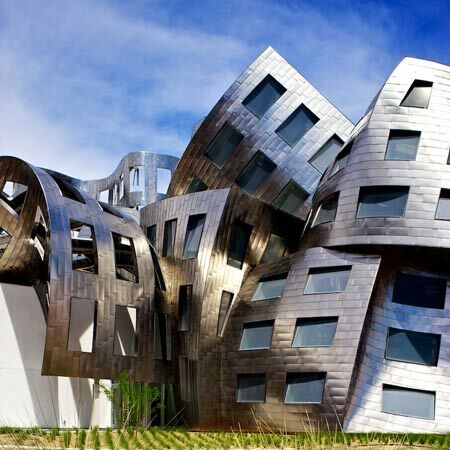 "Located at the intersection of I-15 and I-95 in downtown Las Vegas, Nevada, the Cleveland Clinic Lou Ruvo Center for Brain Health holds the distinction of being the first organization to open for business in Symphony Park, the city’s 61-acre arts and science redevelopment program. Preserving memory: With both administrative offices and medical research and clinical operations, Keep Memory Alive and its medical partner, the Cleveland Clinic Lou Ruvo Center for Brain Health, provide a full-service approach towards preserving memory. While Gehry’s design incites varied reactions from observers, the one consistent response is a desire to come inside its walls and learn more. In this respect, the building is an unwavering marketing tool, driving awareness to the work conducted by those inside." Gehry deftly manipulates space and materials to create stunning structures that captivate the imagination. His design of Keep Memory Alive’s headquarters at the Cleveland Clinic Lou Ruvo Center for Brain Health has been nothing short of remarkable. The Gehry teams have created a masterpiece of architectural design, blending strong visual impact with superior efficiency in patient care. Gehry wanted to create a place in Las Vegas that will be memorable. Gehry is putting a lot of his own heart into the building, and acknowledges a personal connection. The wife and three brothers-in-law of Dr. Milton Wexler, Gehry’s longtime analyst and friend, were stricken with Huntington’s disease, a devastating neurological affliction that is now supported by Keep Memory Alive. For roughly 35 years, the architect has served on the board of Wexler’s Hereditary Disease Foundation, established to study Huntington’s, which is why this project with Keep Memory Alive is so close to Gehry’s heart. Gehry’s design of the Center will be the focal point of the new 61-acre Symphony Park arts and science development in downtown Las Vegas, Nevada, and will undoubtedly be a lasting signature for the master architect.